Photo of the Nest Secure Alarm System, courtesy of Nest. The Nest Secure Alarm System is a product developed and distributed by a company called Nest. Nest makes simple and thoughtful home automation products for the home. The company, which is owned by Google (Alphabet, Inc.) produces self-learning, Wi-Fi enabled thermostats, smoke detectors, cameras, doorbells, smoke and carbon monoxide detectors, and a host of other products that connect to these devices. In 2011, the company introduced the Nest Learning Thermostat as its first product and it was met with tremendous success. The company’s secure alarm system is designed around the needs of the user. In addition, the system provides top-notch security for your home and family. As a result, it actually makes your life easier. The Guard equipment includes the keypad, alarm and motion sensor and serves as the brains of the overall system. Users entering or leaving the home or business can enter a pass code on the keypad or they can use the Tag device (described below) to simply tag in our out. The Detect equipment includes sensors that you attach to doors, windows and rooms. Once the sensors are attached to doors and windows, the alarm lets you know when specific doors and windows are opened or closed. The Detect equipment can also be attached to a wall to serve as a motion sensor. You can buy and configure as many sensors as needed for your home or business. If you need to go out the door, say to take out the trash, you can push the button on the door and go out, but the system stays armed. Most people buy a unit for each exterior door, windows at ground level, and multiple units to identify movement in key areas of the building. The Detect devices come with a feature called PathLight, that lights up as you walk by. A helpful feature if you need to see in the dark. The Tag is a key fob that allows users to arm and disarm the system without entering a passcode. Just tap the Tag on the Guard keypad (described above) to enable and disable the system. You can buy as many Tag devices as needed, just in case you need to provide other people with access to your home or business. If a particular Tag is lost or is no longer needed, you can disable it so it stops working. In addition, you can setup schedules, just in case you need to let someone in at a particular time. The package doesn’t include Cams, but the alarm system can be easily setup to work with Cams throughout your home and property. This will allows you to actually see what is going on. If it is something of concern, you can quickly call the police. With a subscription to their Aware service, you can even send a video clip to the police to let them know what is going on to help prepare them for what they will find on scene. In addition, the video clips serve as proof. Battery Backup – The package includes a battery backup, so everything will continue working even in the event of a power loss. Cellular Backup – The system uses a wifi connection. A cellular backup system is available at an additional cost in case the wireless connection is lost. The equipment is easy to install and configure. Most people can handle the installation themselves using the instructions included in the box. There are also helpful videos available online and at the company website. If you’d prefer not to go it alone, certified professionals can handle the setup on your behalf. Visit the website to hire a local pro today. Professional monitoring services are available from Moni Smart Security to keep an eye on your home while your away. You don’t need professional monitoring to setup and use the equipment. With easy installation and built-in monitoring features, you really can do it all yourself. There prices were current as of the date we wrote this article, so check the website for the most current pricing. If you’re interested in buying the system, go to the website. The total cost for the starter package is $499. This includes Includes 1 Guard, 2 Detects, and 2 Tags. You can always add additional Detects and Tags, depending on your personal needs. Detects are currently $59 and Tags are $25. There is also a Connect product that connects all of the components, even if you place them far apart. Think of it as a bridge between devices. The costs can add up if you have a large home, but these are one-time costs and you can’t really put a price on your family’s safety. Purchase the equipment at a number of retail stores, including Best Buy, Home Depot, Lowes, Target, Walmart and many others. Prices and optional equipment may vary, depending on the store. The Nest Secure alarm system works with Indoor Cams, Outdoor Cams, Hello, and Yale Lock. 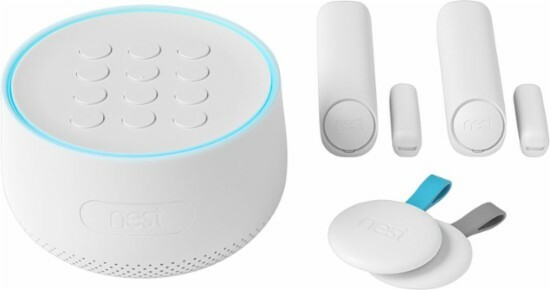 In addition, a new product that will work in conjunction with the alarm system is the Nest Hello. The Hello is a hardwired smart video doorbell with facial recognition. In fact, it is similar to the popular Rink doorbell that is currently on the market. The device will be available in early 2018. If you have any questions about the Nest Secure Alarm System, please leave a comment below. Also, learn about other Home Security Systems.